I don't know what had originally attracted me to the 1958 Mercs. Perhaps it is because they are just really cool. Now, I have 3. 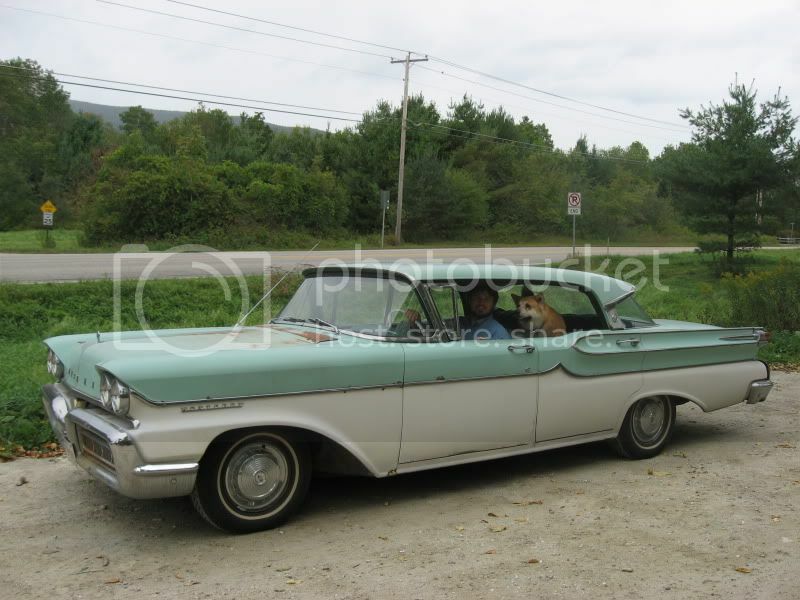 The first one I found is a 1958 Parklane. Tuxedo black with a white roof. I bought it with the engine out and missing other parts. It came from Minneapolis, Minnesota and with the help of a friend we trailered it down to Melbourne, FL. Then it rode the trailer to Massachusetts. Sat in storage for a few years. Now it's in my shop on a lift over a 69 Cougar XR-7 S code. It is a 430 4v car---360 hp with a Multidrive transmission. The Lincoln/Mercury 430 was the largest displacement engine available in 1958. The rare Super Marauder 430 6v also had the highest hp----at 400. This car is on the list to restore. Not sure where on the list, but it's there. A few years ago, NOS parts seemed to be somewhat plentiful on e-bay----and cheap! Now, parts are harder to find. 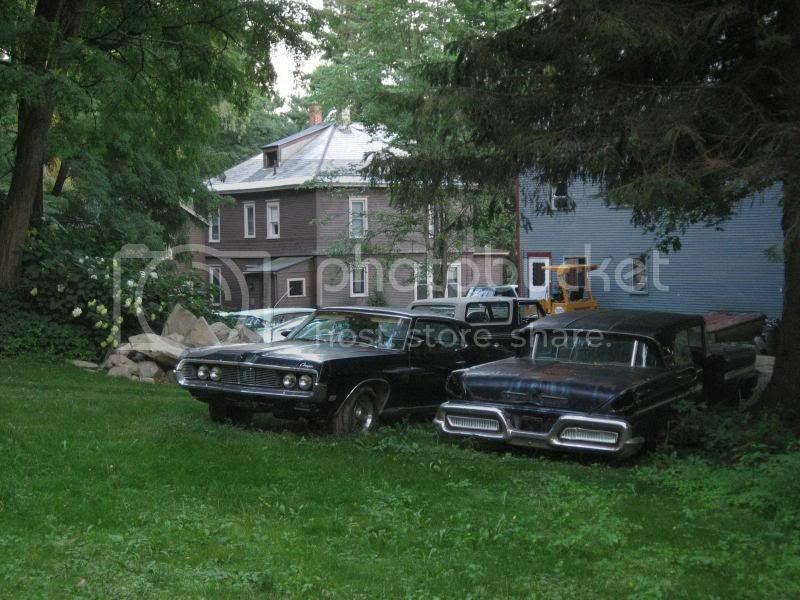 I say if I were only able to keep two cars, it would be this 58 Parklane and my 69 Eliminator. 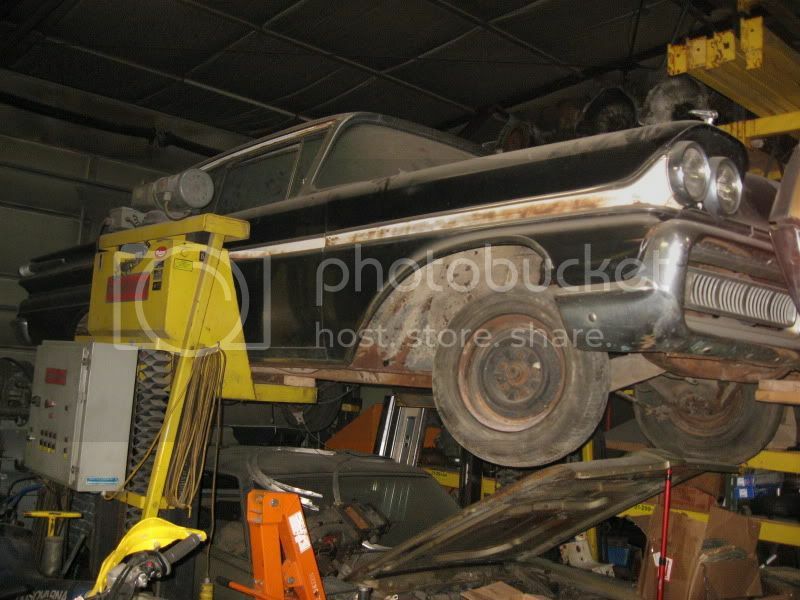 The next is a 58 Monterey 4 door with a 383 4v and Merc-o-Matic. 312hp. It was a good summer driver. This is yet another car I found on e-bay before I left Melbourne and picked up after I moved to the northeast. Selling a house helped my car collection. The odometer had shown less than 21,000 miles. A lack of wear on the pedals, and other points of contact with the interior seemed to prove the mileage to be accurate. The seat cloth was very fragile from age and it wasn't long before I split the material with my elbow when leaning over to roll down the passenger window. It was 08 or 09 that I took this car to Carlisle. The few things I did to the car were rebuild the trans, replace the muffler and tailpipe, put on new tires and rebuild the Bendix Treadle-Vac brake booster. The car still had original radiator hoses! They held liquid just fine as long as I left the radiator cap loose. Before heading to Carlisle, my total extent of driving this car was once around the block. It made the 6 1/2 hour drive there and back just fine. My speedometer wasn't working because I didn't hook up the cable due to a seized reverse lockout device that the speedo cable runs through. Following a friend from NJ to Carlisle I asked how fast we got up to and he said "about 85". It must have been a site to see this big green and white yacht pass by so fast. It ran smooth the whole way. This car was also my spring/summer/fall driver until one day I was backing it off my drive-on lift. The ramp of the right deck had a corner that stuck up a little bit---like a half inch. Well, this Merc sits low in the right rear and the ramp corner just caught my muffler and dug in as I was backing up at about half walking speed. Well, it pushed my exhaust forward. Broke the bottoms off of both exhust manifolds and broke the power steering cylinder rod in half. I was getting kinda flustered and the car sat for about a year. This spring, I brought the car back into the shop. replaced both manifolds and replaced the power steering slave cylinder. A friend with an exhaust bender fixed the rest of the exhaust. So, I've been driving the car a fair amount this season, which makes me pretty happy. The 58 Monterey is also on the list. Since this car is driven so much, I don't think that it will be getting a frame-off restoration. The underneath is pretty good anyway. Some fresh paint, interior repairs and cleanliness will go a long way for this car. It'd be nice if it looked as good as it runs. The last 58 is a Montclair Turnpike Cruiser. Unfortunately, it's a parts car. I really bought it for the engine and trans and the seller said give me another 100 and take the whole thing. I've used some parts from it already. But need to get rid of the junk and store the useable stuff. Picture coming soon for this one. Here is an AWESOME video I just found. You've got quite the collection. I bet it's a great feeling getting out and driving classics like yours. They have character. A great feeling of looking at Mount Overwhelming ascend above the clouds when it comes to all these projects. Most of the charactor is formed by mother nature. On the other hand, my SS is in good shape---one down, about a dozen to go. 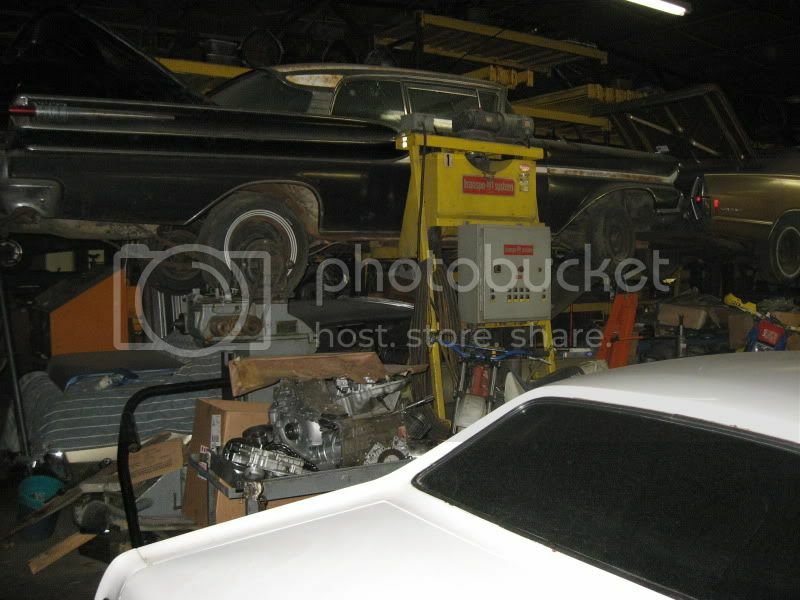 People make fun about me having all these cars that need full restoration or no less than a lot of work. They are usually the same people that carry regret of selling a cool car back in the day for something more practial or economical. I have pretty much all the cars I want. Couldn't afford to buy them restored. Back when they were good--cheap--and plentiful I was playing with Matchbox and Hotwheels. Perhaps hearing the stores about how one guy wishes he never got rid of such and such car is one of the reasons why I have a fleet. Plus, even though a dollar bill has interesting and intricate artwork, I prefer the visual appeal of classic cars. Mercury being my favorite. I'd trade dollars for an old Merc any day of the week. Mercs aren't the only thing I have passion for. All day today I have been working on the house. An 1897 Victorian----that needs a foundation-off restoration. 1967 S Code wrote: You've got quite the collection. I bet it's a great feeling getting out and driving classics like yours. They have character. Ah, I forgot to mention....thank you. 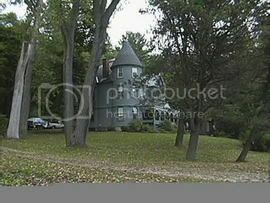 I really like old houses like that as well. Unfortunately there are none in my area that were built in a place I'd want to live. I don't completely dislike the idea of neighbors, but I need a lot of space. And I already have more than my fair share of taxes, I don't need some town/village piling more on top of that. 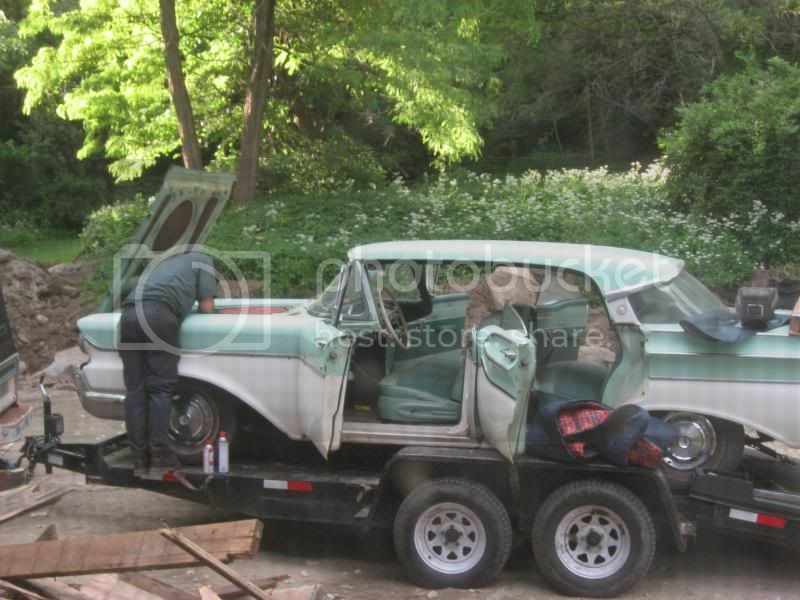 Here is another pic of the 58 Monterey. This was when I first brought it home.